One and Five Mountain Road office buildings by Miller & Favazzo Properties - quality real estate development and property management. 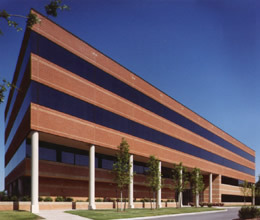 This 140,000 SF development consists of two three-story buildings and related structured parking. At the time of its development in 1988 it housed offices and laboratories for Integrated Genetics, the predecessor to the biogenetics firm of Genzyme Corporation. It was designed by ADD Inc. with a red-brick façade and copper-colored insulated glass.